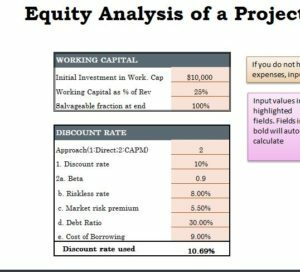 You can now analyze the value of your equity project before you even buy them with the free Equity Analysis Capital Budget template. This free sheet does all the calculations for you, all you need to do to use this document is enter a few pieces of key information that are inquired throughout the document. In no time at all, you can start making informed decisions about your investments, you’ll be surprised with what you can achieve this simple calculator at your side. To download and free template and learn how to use it, just follow the guide we have provided below and get started. You will first need to download the free Equity Analysis Capital Budget document by following the link at the bottom of this page. The next step will be to enter the initial investment information in the first table of the document. These items will include the investment, opportunity cost, salvage value, etc. The next table is for entering the cash flow details, what you will be making in terms of revenue from a renter based on market prices. You will also give your working capital in the next table, then the discount rate information in the last table. In the “Growth Rates” tab, you can see revenue percentages and fixed expenses through the year. The Equity Analysis Capital Budget will take the information you have entered above, and give you the initial investment data that you will need to make and the possible ROI as well. Below that, you will also find spaces for salvage value, operating cash flow, investment measures, and book value/depreciation. You can see how useful this all-inclusive tool will be when trying to decide on a property to invest in. If you’re ready to buy a successful rental property for your next investment venture, download this free template today!